Wildlife Recovery Association was incorporated in 1979 to provide services for and about wildlife and promote a better understanding of their needs. 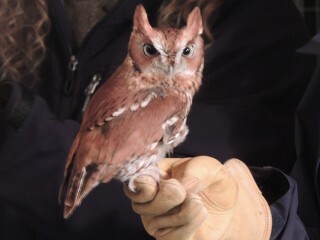 We provide quality educational outreach programs with live birds of prey, participate in research and management programs to support rare and endangered species, and provide care for orphaned and injured hawks, owls, eagles, and falcons. We reach students of many ages; in this photo, a hard working group of university students has completed a nest box study on Little Swamp Sanctuary. We learn from wild birds, as well as birds in rehabilitation from closely observing their behaviors. 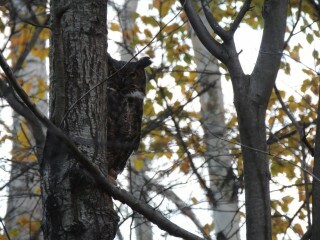 This photo shows a great horned owl that has recovered from injuries, and has just been released. She is already blending with her habitat, a few minutes later, she was part of the forest. 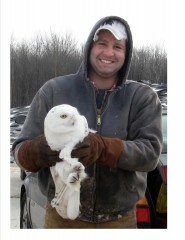 A snowy owl about to be released. Wildilfe Recovery Association travels to many schools to inspire students to pursue their goals in science, math, journalism, and the arts. Our goals in education are primarily to help people understand, appreciate, and protect wild hawks, owls, eagles, and falcons, and their connection with all of nature. We also incorporate many science concepts into our school programs, inspiring students to learn more: to think critically, to write well, to sharpen observation skills, and to incorporate art, music, and journalism into their educational goals. We provide rehabilitation services to injured and orphaned hawks, owls, eagles, and falcons. Our veterinarian, Dr. White, has 30 years of experience working with birds of prey. 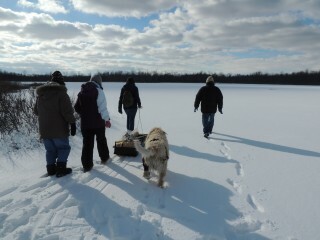 In addition, we work with several veterinarians in various parts of Michigan. Housing for recovering birds includes 5 flight cages from 30 feet in length to 100 feet. A network of volunteers assists with transport of injured birds when necessary. 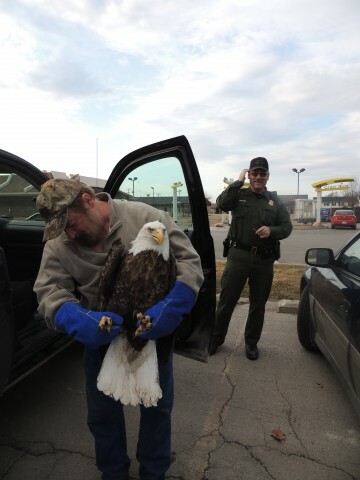 We often work with law enforcement agencies whose employees assist in the rescue of birds of prey. For almost 30 years, we assisted with the reintroduction of peregrine falcons at wild sites in Michigan’s Upper Peninsula. Now, we monitor peregrine nesting areas to ensure their continued ability to thrive and produce young peregrines. 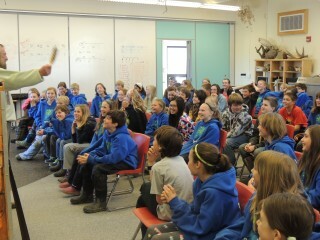 We also encourage citizen science, projects such as nest box construction, and we support university research projects. Thirty years of field research has helped tremendously in understanding these magnificent birds. 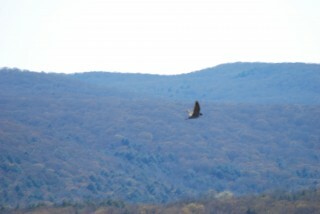 Here, a peregrine falcon flies past as we watch from the cliff. Error: Error validating access token: Session has expired on Monday, 15-Apr-19 10:07:27 PDT. The current time is Monday, 22-Apr-19 11:20:00 PDT.